We’d love your help. Let us know what’s wrong with this preview of Doggone Dead by Teresa Trent. To ask other readers questions about Doggone Dead, please sign up. Betsy finally gave in and allowed her son Zach to have a dog, but when the dog runs away, he leads Betsy to yet another dead body. With the town blaming a ghost for the murder and her father being accused of planting evidence, she has another mystery to solve. Welcome back to Pecan Bayou, one of my favorite fictional towns. One of the great things about being a book blogger is finding new favorite authors, and that is exactly what happened last year when I first reviewed her earlier works, A Dash Betsy finally gave in and allowed her son Zach to have a dog, but when the dog runs away, he leads Betsy to yet another dead body. With the town blaming a ghost for the murder and her father being accused of planting evidence, she has another mystery to solve. Welcome back to Pecan Bayou, one of my favorite fictional towns. One of the great things about being a book blogger is finding new favorite authors, and that is exactly what happened last year when I first reviewed her earlier works, A Dash of Murder and Overdue for Murder. She writes a nice cozy mystery with just a hint of romance and a decent amount of humor. The storyline never lags, and the book ends just where and when it should, with all loose ends tied neatly together. All of the characters are genuinely likeable. Betsy is a strong single mom who is not afraid to follow her instincts, and Aunt Maggie is, for lack of a better term, a hoot. My favorite character is her cousin Danny. This time, I worried that he would be hurt, emotionally as well as physically, and I was ready to go after someone. That's when I realized how well the author had crafted her characters. I'll stop before I sound gushy and mushy, but really, this is a fantastic little mystery from one of my favorite authors. I love reading mysteries where they provide recipes and/or tips. This mystery has the usual suspects in the death of a blackmailer, add in a legendary ghost who may or may not be trying to kill Betsy, and a surprise ending. Puppies and murder don't mix. This Betsy finds out the hard way. If you enjoyed the previous 2 books you're in for a treat. If you haven't but enjoy a cozy mystery with a real family story then give this a read. Literature with dogs as supporting characters is as old and new as literature itself, so it’s no wonder that this Teresa Trent mystery featuring single mother Betsy Livingston begins with the search for Butch her son’s lost/kidnapped puppy whose blood covered paws lead to the discovery of a dead body. DOGGONE DEAD is the third book in this series set in the small Texas town of Pecan Bayou. The townsfolk include an unusual array characters ranging from the proprietors of the local watermelon farm Literature with dogs as supporting characters is as old and new as literature itself, so it’s no wonder that this Teresa Trent mystery featuring single mother Betsy Livingston begins with the search for Butch her son’s lost/kidnapped puppy whose blood covered paws lead to the discovery of a dead body. 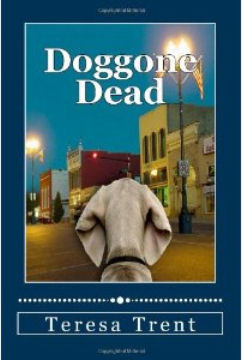 DOGGONE DEAD is the third book in this series set in the small Texas town of Pecan Bayou. The townsfolk include an unusual array characters ranging from the proprietors of the local watermelon farm and their sketchy son and the aging daughter of a long dead movie cowboy to the towns new D.A., a local veterinarian who employs Danny, Betsy’s mildly Down’s syndrome nephew and Aunt Maggie – paranormal investigator. Pecan Bayou is a town rife with slightly quirky characters and the customary small town events like the “little Miss Watermelon” beauty contest and Pet Parades that is guaranteed to leave the reader with that warm, fuzzy down home feeling. Additionally, because of Betsy’s job as a local newspaper columnist, “The Happy Hinter”, readers are even treated to recipes for tasty items like Peanut Butter Pie and Berry Watermelon smoothies. This is one of those fun cozies that keeps you reading and doesn’t take all that long to finish….you can knock it off in just a couple of hours. There are even a couple of surprises lurking in the pages that I am not at liberty to divulge lest your reading experience be “spoiled”. Love this series! One of the best parts of my recent vacation was finally having time to curl up with another of Teresa Trent's fun reads. The town of Pecan Bayou and the folks who populate it are so real, and the latter are very likeable. This story has lots of twists and turns to keep the reader engaged. I think it's my favorite in the series, so far. I definitely plan to keep reading! Correct rating 3.5 stars. Pretty good cozy. Would like to see more of the series. Some typo and misplaced quote issues, but nothing series. Liked emphasis on rescue dog, but characters made it sound like chips are tracking devices (they aren't. they're just a form of ID that can't be lost). Great mystery. It has it all - dogs, kids, ghosts, romance, and a bit of misdirected e-mail that could have been disasterous. Even the title of the series - Pecan Bayou hints of mystery and fun. Excellent choice for a good read. What a cute, fun, easy read. I will definitely keep these in mind the next time I'm looking for a fun quick read. Character Betsy is quirky, funny and intelligent. Oh the trouble she gets herself into! Engaging and fast read! Highly recommend this series. A great short story, I loved the characters, give it a 4 star rating. #3 in the Pecan Bayou cozy mystery series. I like this series. It is set in Texas. My favorite state! Another pleasant cozy. I like the characters and the story has a bit more development in the plot. Typical cozy but I enjoyed it enough to read others.